To celebrate the UK DVD release of Mitsuko Delivers, the latest comedy from Japanese film director Yuya Ishii, Japan Centre is running a competition to give away 3 copies of Ishii’s quirky film Sawako Decides to three lucky winners! 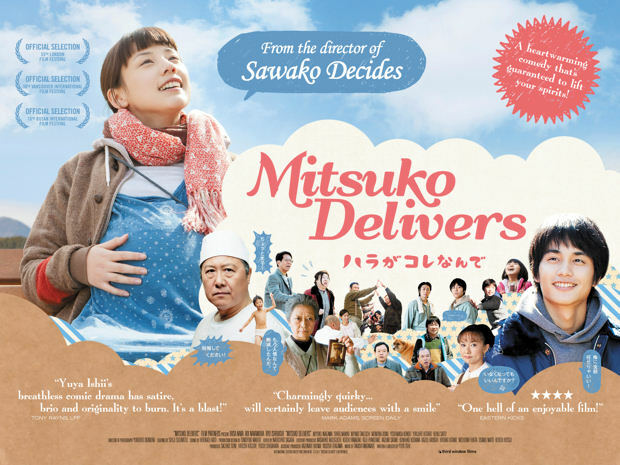 The newest film from director Yuya Ishii, ‘Mitsuko Delivers’ comes out on DVD July 9th at all major online and high-street retailers. This breathless new comedy tells the story of a woman (Riisa Naka, Summer Wars) who’s at a delicate juncture in life; alone, flat broke and to top it all nine-months pregnant. Her folks think she’s in California living the high life with her baby’s GI father. In fact she’s in Tokyo, searching for a purpose, and eventually finding one in the ramshackle working-class alley where she grew up… Mitsuko Delivers is original, fanciful and adventurous – quintessentially Japanese. For more information about screenings make sure you check out Third Window Films. A random winner will be chosen and contacted on Friday, June 13th. Good luck everyone and make sure you keep an eye out for the next Japan Centre competition! Its a hard one this time! For me it has to be Instant Swamp. I love that film! Its brilliant. I had a hard time with this too! I loved a drama I watched on Drama Crazy called At Home Dad, really made me laugh watching him cope with the role reversal! I really laughed at a lot of the scenes in Love Exposure/愛のむきだし especially the photography scenes where they’re using all sorts of gadgets and ninja tactics to take pictures of the unsuspecting. I also really cracked up watching Sawako Decides/川の底からこんにちは with that song they all sing near the end where they moan about their taxes being too high and how they’re stuck with losers, so funny!